If you want to grow something quite different, this is it!!! Called the yellow Bird of Paradise, although it is no relation to the more well know Strelitizia, it's amazing late Summer and Autumn flowers really do look like an amazing display of bright feathers. Rarely sold or grown in the UK, Martin discovered it on a Spanish Nursery on a trip there recently, and bought all we were allowed to! It has fine feathery foliage, like an Acacia, it is borderline hardy in UK, so we advise protecting from frosts in Winter. So grow it in large pots in sunny spots, and enjoy its amazing flower dispalys in late Summer. If you want to grow something different, then this is the plant for you! The yellow flowers reach around 2.5cm (1in) and are extended further, sometimes by as much as 7.5cm (3in), by the showy stamens which are produced on erect stems 15-30 (6-12in) long. 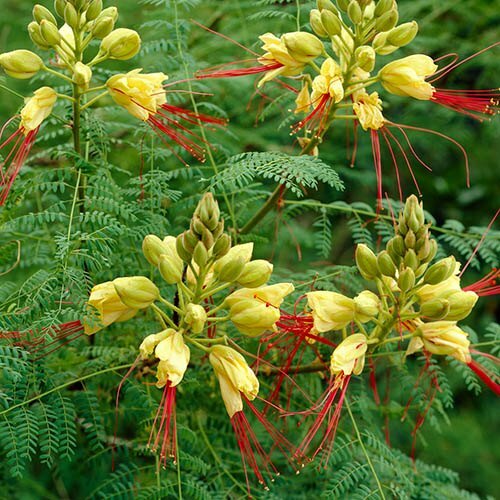 The blooms are a favourite with humming birds in its native South America. Supplied as a 3.5L pot, plant about 40cm tall.